For the best experience, click the "Full Screen" Icon. Today must have been some serious racing. Speeds today were over 30KPH and there were 87 in goal. Marcus Malmqvist was first on the UP Edge XR, followed by Yassen Savov (Boom 8) and Andreas Malecki (Mantra R10.2) and Josh Cohn (Niviuk Proto) and Charles Cazaux (Mantra R10.2). Overall leader Michael Sigel placed 21st today, scoring 891 points and holding on to his cumulative lead. No tasks will be dropped during this PWC so what you see is what you get. Nick Greece is the top US pilot at 9th, and Josh Cohn is at 13th in the cumulative ranking. With two tasks remaining, this is proving to be a great opening competition for the 2011 season. The top-10 pilots are on Gin Boom 8's and Ozone R10.2s. Niviuk is represented by Josh in 13th and Stefan Wyss in 14th. This year is looking like a very competitive year for the manufacturers who are striving to push the performance limits. I'm not sure of the ranking below third place, since so many were around the 86Km point. It looks like Nick Greece and Josh Cohn are hanging in there, and both may be in the top-10 when Cumulative Scores are up. The third task was considerably shorter than previous tasks at 60 Km. This allowed all but 13 pilots to make goal. The top-15 all had average speeds of around 20KPH so it looks like it was a slow day. Yasson Savov and Russ Ogden are emerging as the most consistent leaders. They were third and fourth in the cumulative rankings and placed first and third today, so it looks like they will be at the top of the leaderboard. Jack Brown was second today, and the only US pilot in the top 20. Nick Greece was in 25th. For results you can go to http://www.paraglidingworldcup.org/htmlrequest/results/t/1/3/1 . Cumulative scores seem to be a secret. There may be cumulative scores in the comments on THIS PAGE. Mads Syndergaard is an experienced, and quite accomplished XC competition pilot. He also doesn't mind passing his voluminous store of information to those with XC dreams. I received my copy of Flying Rags for Glory. . . last month and found it to be well written and comprehensively informative. 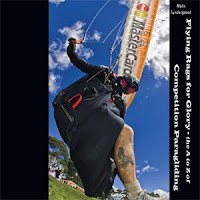 The book is written primarily for paraglider pilots contemplating entry into the comp scene. You'll find that this book contains much of the same kind of information, directed at new pilots, as my article "Flying in Paraglider Competitions" but this book also has considerable information that is of value to advanced pilots with goals of flying the best equipment and flying to their max potential. One of Mads' strengths as a pilot, and as an author, is his interest in the psychology of winning. He emphasizes and reinforces, with examples, that those who assume they will win, have an edge that is tangible. He also references studies of the sub-conscious and its role in high level activities. I found this section of the book to be very interesting and informative. Mads has been flying for most of the years that our young sport has been evolving. He does an excellent job of relating his experiences competing on wings of dubious flying characteristics and modest performance. Many photos are used to illustrate the wings and characters of the early years. Flying Rags for Glory is available exclusively in the XCSHOP. If you decide to purchase this book, please click the graphic at left or this text to visit the website. I will get credit for the referral. This is the only revenue generation I use on this site. Another tough day, from the sound of it. 123K task and it looks like everyone has landed short of goal. Looking at the 'Live Leader Board' Eric Reed placed second a few km. short of goal. Nick Greece, Josh Cohn, and Jack Brown landed around the 116k point. Results are in the window below and available at http://www.paraglidingworldcup.org/htmlrequest/results/1/2/1. The first task of the Colombia PWC was a 94 kilometer zig-zag that had as many pilots landing near the 1/2 way point as it had in goal. With the pilot caliber that these events attract, it must have been a tough day. Jack Brown and Josh Cohn are in 15th and 16th respectively, and Brad Gunnuscio, Eric Reed, and Brett Zaenglein, all scored around 350 points, landing mid-task. Results can be viewed in this .PDF file. Volando en Roldanillo - USA is 1, 2 ! Well it's over in Columbia and Eric Reed was consistent enough to win the Gold. Brad Gunnuscio finished strong to move up to 2nd, and Nick Greece finished at 15th after a great effort in the last two tasks. Jack Brown was 28th and Max Marion did a respectable 50th in one of his first international events. This is certainly a great showing in this comp, and bodes well for the US guys during the Columbian PWC event next week. Eric Reed is still at the top of the leader board after 5 tough tasks. He is showing his tenacity and skills among a very talented field. In addition, Brad Gunnuscio has climbed into 3rd place and Nick Greece is in 18th. I'm sure Jack Brown is a bit frustrated in 30th, but it is tough to come back from 2 bad days at the start of a competition. Good luck to the guys! Tomorrow's task will be the 'decider' so check back for the final results. The overall results can be viewed in this .PDF file. The competition is on in Columbia at the Volando en Roldanillo. After three tasks Eric Reed is leading the pack with his signature consistent 'badger' style flying. He won the first day's task, placed 6th in task two, and second in the third. Brad Gunnuscio is 4th overall and Nick Greece is 24th. Jack Brown tied for first in task 3 after a couple tough days early in the comp. 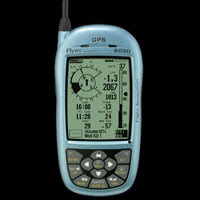 Flytec's 6030 soon to have features of the Flymaster B1Nav! Hey sportsfans - The folks at Flytec just announced there will be a significant firmware update for the 6030 very soon. It is being tested at the January HG comps in OZ and PWC comp in Columbia. If there are no significant bugs reported that cannot be quickly fixed they expect to release it at the end of this month. 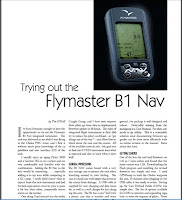 Yep, the $1449 SRP Flytec 6030 will soon (maybe) have the same features as the $630 Flymaster B1Nav.